My husband and I decided to make a weekend out of our visit to Shiloh. We reserved a cabin on a local horse ranch, and took our time driving the scenic route from our home in Oak Ridge, Tennessee, to Stanton, Kentucky. My first observation: if you have a chance to visit this part of Kentucky, you should go! Stanton is located next to Natural Bridge State Park, which is filled with hiking and riding trails and is a destination site for rock climbers. It is an incredibly beautiful place. Sunday morning worship at Shiloh United Methodist Church gets underway at 11:00 a.m. We arrived early to look around the building. We learned that this Methodist congregation has been worshiping since 1873. The first building remains intact across the street from the current building, which was constructed in 1949. The church is located in the Rosslyn community of Powell County, just outside of the town of Stanton. There are no other United Methodist churches in Stanton, although there is a Bible Methodist congregation in town. The sanctuary was traditional, but the congregation had installed a projector and screen, and the chancel area had been arranged to make room for a full praise band. 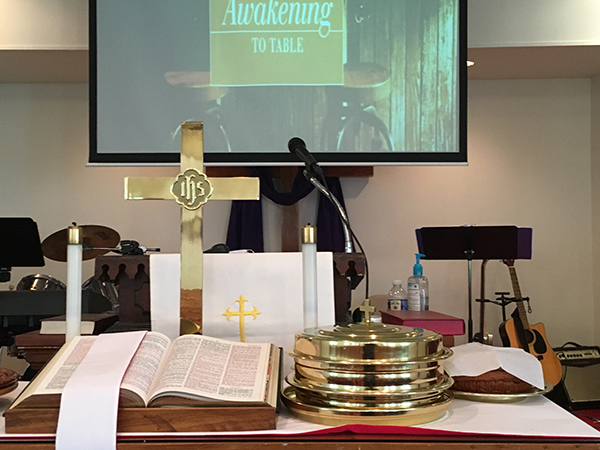 One of the first things I saw as I entered the sanctuary was the “Awakening to Table” graphic from Discipleship Resources for the Third Sunday in Easter. The second thing I noticed was that the table was set for Holy Communion, even though this was the last Sunday of the month. I asked the pastor if they had communion every week, or if communion was being served because of the topic. He responded that we were having communion because the sermon was about communion. He went on to share that the church had a history of celebrating communion quarterly, but they had moved to monthly. He was excited to preach about Holy Communion and to further educate his members to its centrality in United Methodist. He noted that some members did not enjoy receiving communion, and he attributed this to a general lack of understanding about its meaning and importance in the Wesleyan tradition. I would describe the service at Shiloh as blended. The church is blessed to have wonderful musical resources including a praise band and a pianist. The praise band included several guitars, drums, and a lead singer with a strong, clear, gorgeous voice. I wondered aloud to my husband if, being from this part of Kentucky, she might be a relative of Loretta Lynn. She led the congregation in singing both with the praise band and in more traditional hymns accompanied by piano. The pianist was also an excellent musician who, my husband remarked, reminded him of Willie Nelson’s sister Bobbie. Although none of the songs we sang were among those recommended by our resources, they were chosen with care and supported the message Jonathan offered. The congregation followed a traditional order of worship which included several lectionary readings and the Psalter. The opening prayer was offered by a gentleman in the pews, who, when invited by the worship leader to lead us in prayer, spoke his prayer from the heart and loudly enough to be heard without amplification. I appreciated the “work of the people” throughout the service in their praying, singing, and responsiveness. The primary place I noted our resources being used was in the sermon. Jonathan drew the overall theme and organization of his sermon from the preaching notes, but adapted it freely for his context, sharing several personal stories about his experience with the sacrament of Holy Communion. He also commended a Discipleship Ministries study booklet, The Meaning of Holy Communion in the United Methodist Church, for the congregation’s study. He spoke with enthusiasm and authenticity, and gave a heartfelt and informative sermon. After the service he shared with me his appreciation for the sermon notes and the worship ideas each week. 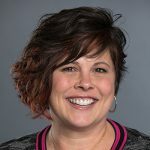 As a full-time seminary student and a solo pastor, he found the worship resources to be extremely helpful in his weekly worship planning and sermon preparation. After the sermon Jonathan led the congregation in the “Prayer of Great Thanksgiving” in Word and Table I from the UM Hymnal as we shared in the sacrament of Holy Communion. I found the prayer to be especially meaningful in light of the teaching and witness we had just heard in the sermon. I imagine the members of the congregation heard the prayer in a new way as well, having just received these insights. Truly Jonathan opened our hearts not just to hear, but to experience the power of sharing in the sacred meal together. I would be remiss not to mention that after the service my husband and I gathered around the Tullos family table to share in another sacred meal, prepared by the hands of Jonathon’s wife, Jessica. The food was delicious and the fellowship with our new friends nourished Scot and me well for our journey home. I give thanks for Rev. 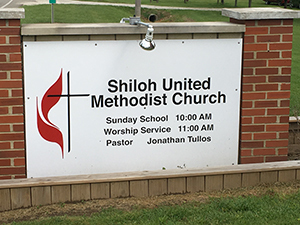 Jonathan Tullos and the congregation of Shiloh United Methodist Church for their warm welcome and faithful witness to the people of Powell County, Kentucky. Well done, good and faithful servants!